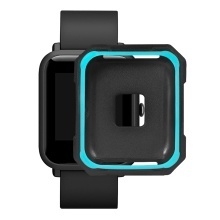 Soft case for Amazfit Bip Bit Youth Smart Watch. Easy to install and remove, full protective edge, avoid scratch in your daily life. Soft TPU material, great permeability suitable for daily wear. Slim and lightweight design, access to all controls, button. Please confirm the smartwatch model before purchasing it. It does not include watch.